Tickets £10. "She has filmed David Beckham sleeping and made grown men cry. Now artist Sam Taylor-Wood has just finished directing a short film, Love You More, with a script by Patrick Marber. Inspired by the Buzzcocks single of the same name, the film is a tender love-story set in the heady punk days of 1978. Sam Taylor-Wood takes photographs and makes films that examine our shared social and psychological experiences. 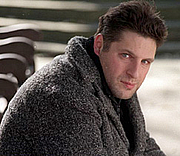 Patrick Marber is a playwright (Dealer’s Choice, Closer and Don Juan in Soho) and screenwriter (Notes on a Scandal). He is currently adapting Ian McEwan’s Saturday for the screen. Patrick Marber is currently considered a "single author." If one or more works are by a distinct, homonymous authors, go ahead and split the author. Patrick Marber is composed of 2 names. You can examine and separate out names.